structure - published by DETAIL will become an independent international trade journal for structural engineers with its own brand identity. The magazine, that was so far only available as a special issue, will be published quarterly starting from the 1st of March, 2018. It is intended for everyone who recognises the importance of structural engineers in the success of ambitious building projects and their significant contribution to building culture. The magazine structure offers a platform that presents engineers as shapers of our built environment. Because creative achievement should be just as much part of the self-image of the profession as technical expertise. With the experience of the DETAIL editorial staff structure will showcase a range of exciting projects that carry the mark of structural engineers, introduce new developments in structural planning and provide contributions to the discussions on the role of structural engineers to society in its print run of four editions per year. Each edition will carry an in-depth documentation of a selection of current projects. This will not only highlight the intelligent structural engineering solutions developed for the project and what makes them so special, but also address the processes that are necessary to erect such demanding buildings and the particularities of the construction process. Thus structure shows the special challenges and solutions of the documented projects to the trade audience but also presents the accomplishments of the involved structural engineers to readers interested in the construction process. The current edition structure 1/2018 introduces outstanding engineering accomplishments such as the new Queensferry Crossing cable-stayed bridge across the Firth of Forth in Scotland with its 210 metre (683ft) high towers and a total span of more than 2.7 kilometres (1.7 miles). It also documents other exciting structural solutions such as the open trusses of a deli market in Stuttgart or the expressive steel construction of a pedestrian bridge in Beer Sheba in Israel. A technology presentation centre in Chicago is the basis for showing how a piece of structural engineering that can be walked on can itself be an exhibition piece. In an accompanying feature article in the first part of the edition Werner Sobek points out the comprehensive responsibility that the engineers must carry for the construction of the future. Finally, two technical articles deal with very different and special structural solutions made with concrete: a complex shell form as a roof structure and a folded-plate roofing with a large span for an office building. 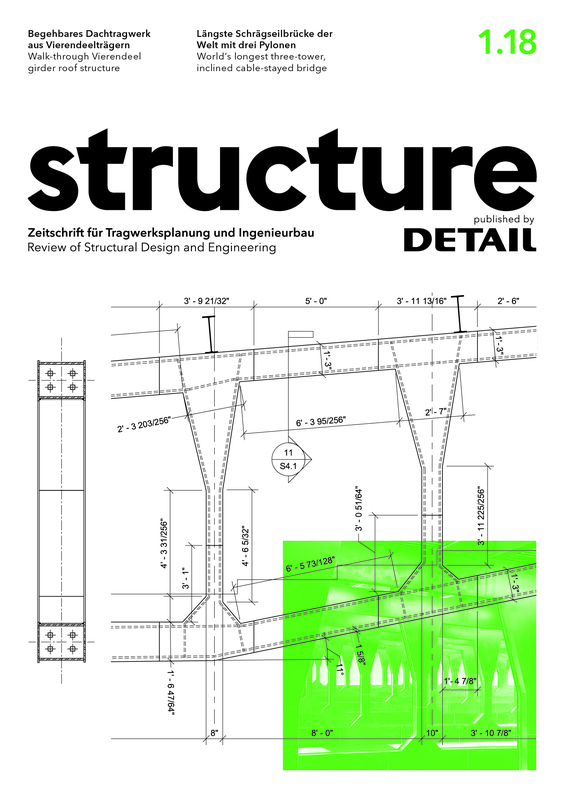 A trial subscription is available and can be ordered by getting in contact with service@structure-magazin.de or by telephone at +49 (0)89 3816200. Further information can be found at www.detail.de/structure.